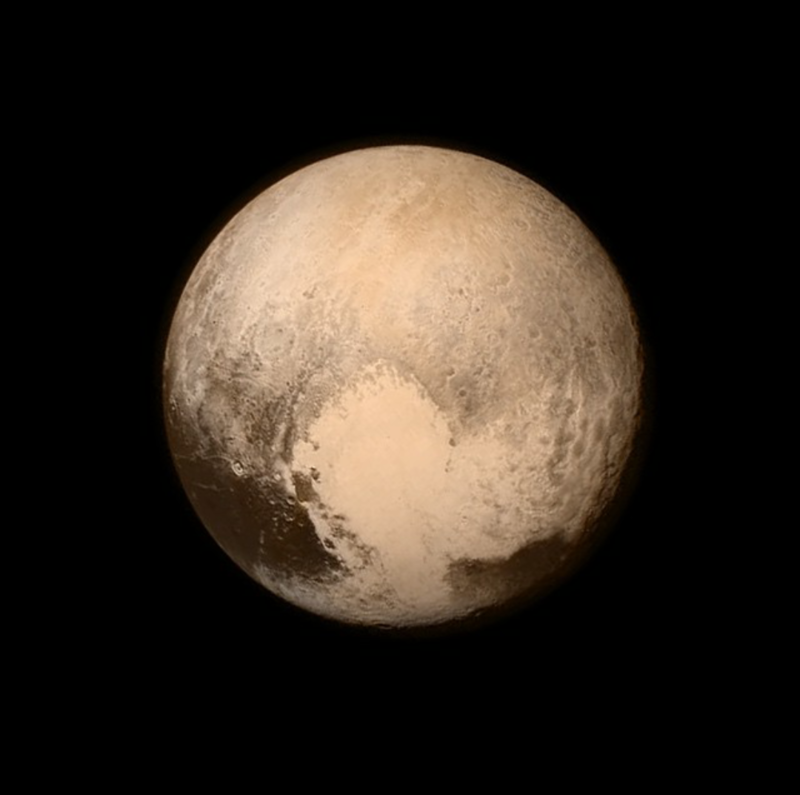 Is it just me, or is Pluto giving New Horizons a bit of a stink eye? The dark bands look like smoldering eyes. 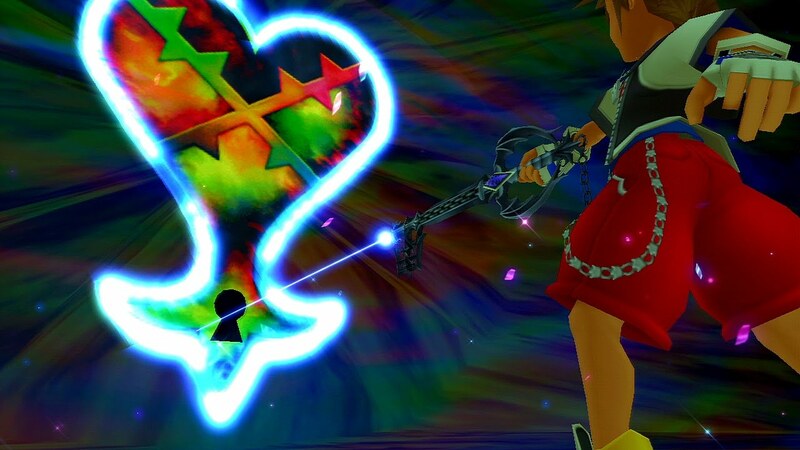 ... oh god dammit. There goes the solar system. Yeah, cause the human infestation on the third planet wasn't enough of a problem. Jeeze, this is what we get for living in a low rent solar system. OH MY GOD. I found a thing on Tumblr. Well, we managed to get a signal back from the Probe after it passed, so that's good. Everything's okay. 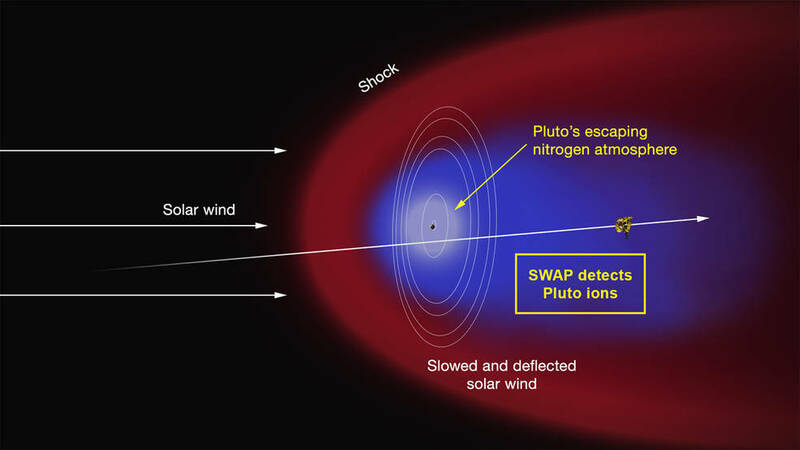 The latest spectra from New Horizons Ralph instrument reveal an abundance of methane ice, but with striking differences from place to place across the frozen surface of Pluto. "We just learned that in the north polar cap, methane ice is diluted in a thick, transparent slab of nitrogen ice resulting in strong absorption of infrared light,� said New Horizons co-investigator Will Grundy, Lowell Observatory, Flagstaff, Arizona. In one of the visually dark equatorial patches, the methane ice has shallower infrared absorptions indicative of a very different texture. "The spectrum appears as if the ice is less diluted in nitrogen," Grundy speculated �or that it has a different texture in that area." An Earthly example of different textures of a frozen substance: a fluffy bank of clean snow is bright white, but compacted polar ice looks blue. New Horizons' surface composition team, led by Grundy, has begun the intricate process of analyzing Ralph data to determine the detailed compositions of the distinct regions on Pluto. 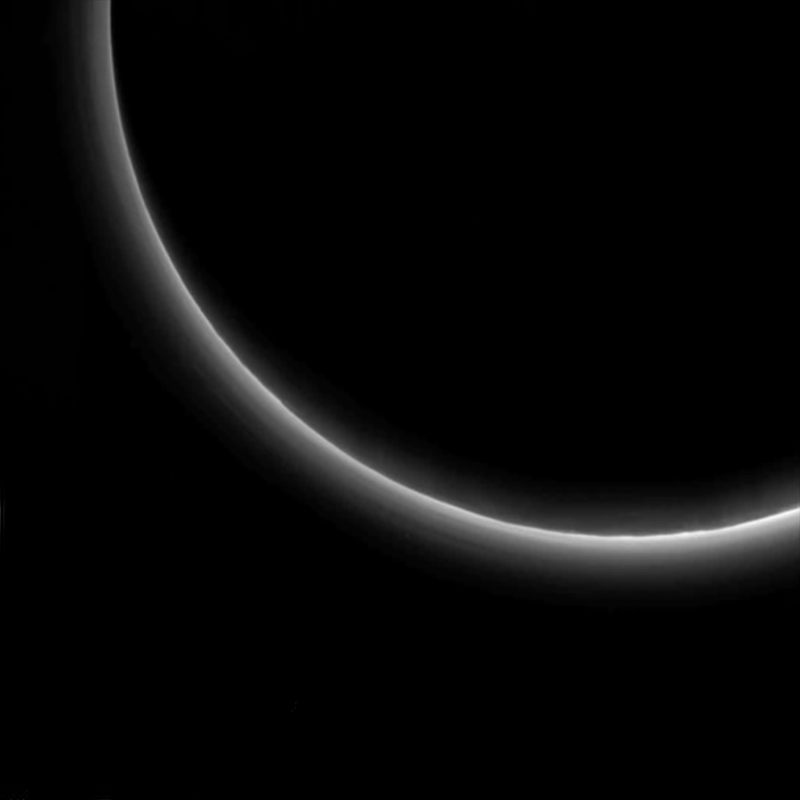 This is the first detailed image of Pluto from the Linear Etalon Imaging Spectral Array, part of the Ralph instrument on New Horizons. The observations were made at three wavelengths of infrared light, which are invisible to the human eye. 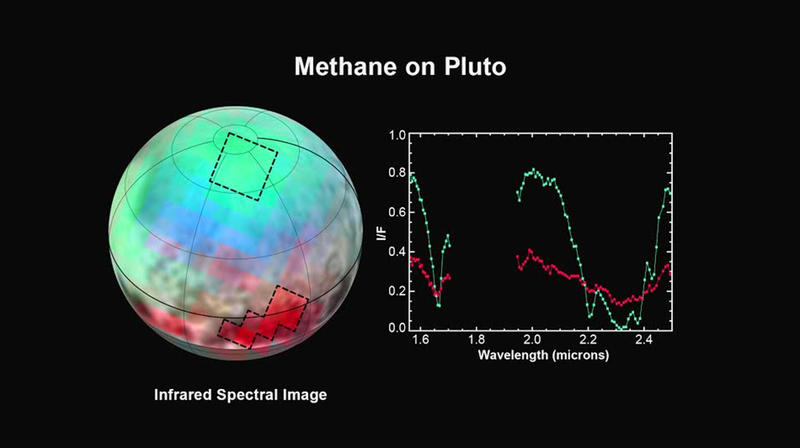 In this picture, blue corresponds to light of wavelengths 1.62 to 1.70 micrometers, a channel covering a medium-strong absorption band of methane ice, green (1.97 to 2.05 micrometers) represents a channel where methane ice does not absorb light, and red (2.30 to 2.33 micrometers) is a channel where the light is very heavily absorbed by methane ice. 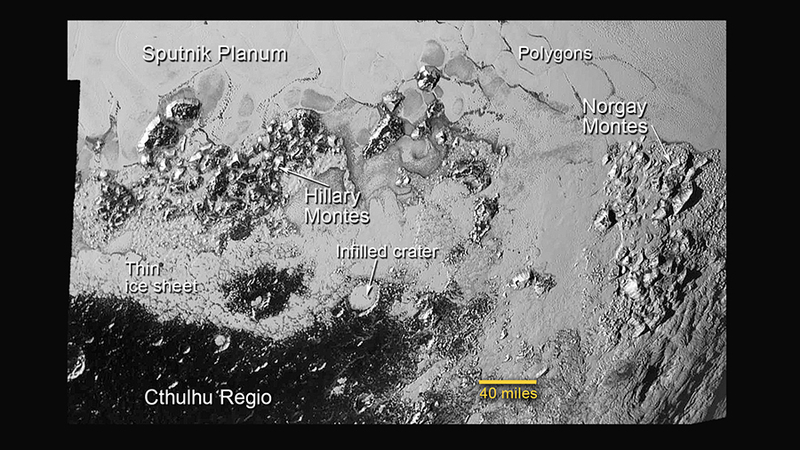 The two areas outlined on Pluto show where Ralph observations obtained the spectral traces at the right. Note that the methane absorptions (notable dips) in the spectrum from the northern region are much deeper than the dips in the spectrum from the dark patch. So that's interesting. Charon especially, I don't think anyone thought it'd be more active like this. 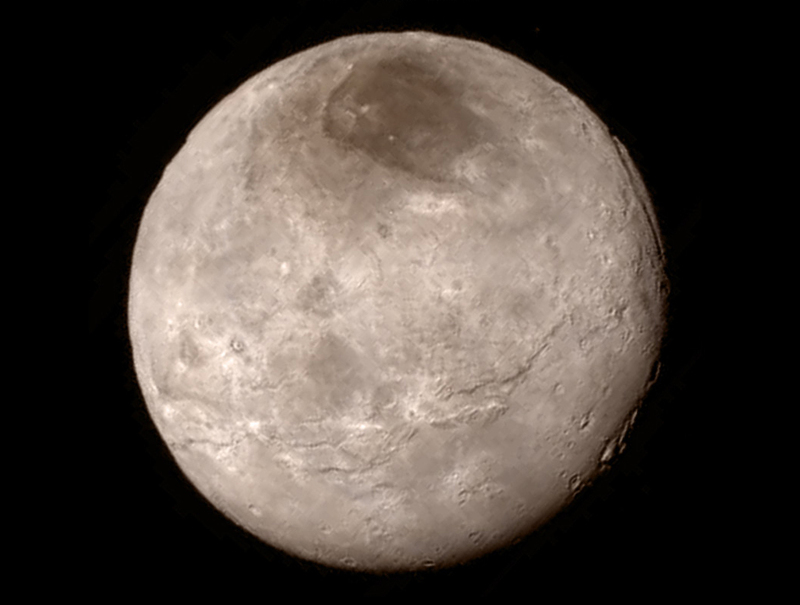 The dark spot on Charon has been nicknamed "Mordor". The mountains likely formed no more than 100 million years ago -- mere youngsters relative to the 4.56-billion-year age of the solar system -- and may still be in the process of building, says Jeff Moore of New Horizons’ Geology, Geophysics and Imaging Team (GGI). 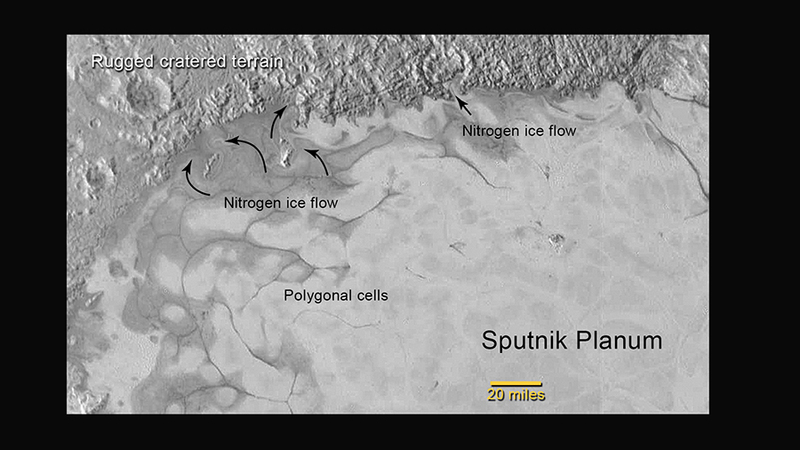 That suggests the close-up region, which covers less than one percent of Pluto’s surface, may still be geologically active today. Moore and his colleagues base the youthful age estimate on the lack of craters in this scene. 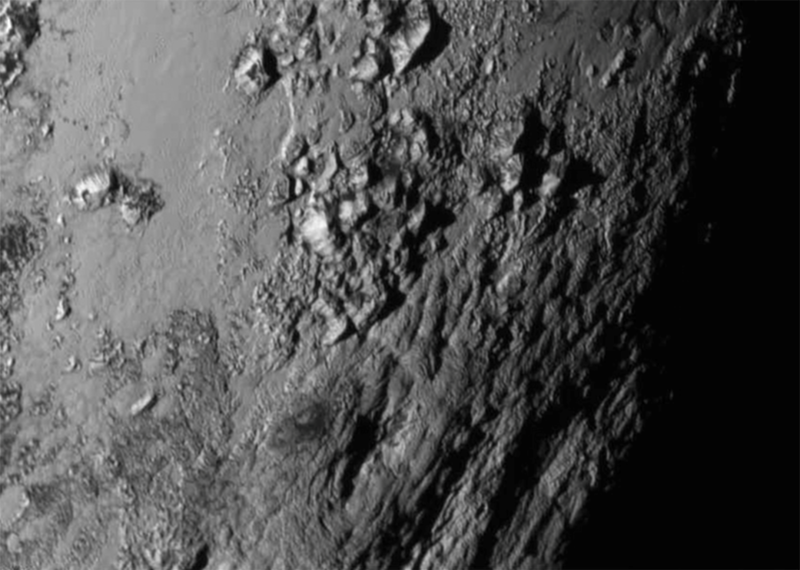 Like the rest of Pluto, this region would presumably have been pummeled by space debris for billions of years and would have once been heavily cratered -- unless recent activity had given the region a facelift, erasing those pockmarks. So turns out Pluto has some of the newest mountains in the Solar System, yet no Jovian gravity or heat to stimulate them. How weird is that? We need to get Jeb to the surface and start collecting samples. While Pluto's largest moon, Charon, has grabbed most of the lunar spotlight, two of Pluto's smaller and lesser-known satellites are starting to come into focus via new images from NASA's New Horizons spacecraft. 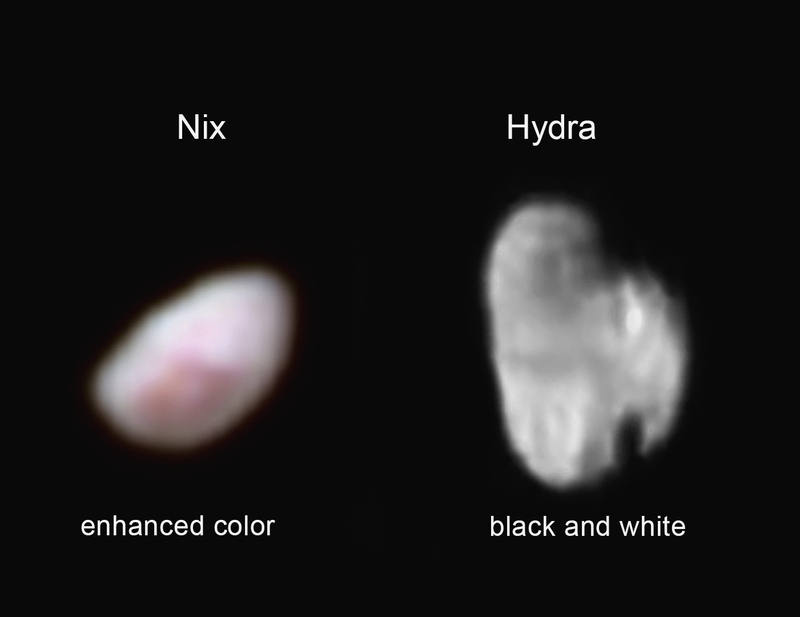 Nix and Hydra – the second and third moons to be discovered – are approximately the same size, but their similarity ends there. New Horizons' first color image of Nix, in which colors have been enhanced, reveals an intriguing region on the jelly bean-shaped satellite, which is estimated to be 26 miles (42 kilometers) long and 22 miles (36 kilometers) wide. Although the overall surface color of Nix is neutral grey in the image, the newfound region has a distinct red tint. Hints of a bull's-eye pattern lead scientists to speculate that the reddish region is a crater. "Additional compositional data has already been taken of Nix, but is not yet downlinked. It will tell us why this region is redder than its surroundings," said mission scientist Carly Howett, of the Southwest Research Institute, Boulder, Colorado. She added, "This observation is so tantalizing, I'm finding it hard to be patient for more Nix data to be downlinked." Meanwhile, the sharpest image yet received from New Horizons of Pluto's satellite Hydra shows that its irregular shape resembles the state of Michigan. The new image was made by the Long Range Reconnaissance Imager (LORRI) on July 14, 2015 from a distance of 143,000 miles (231,000 kilometers), and shows features as small as 0.7 miles (1.2 kilometers) across. There appear to be at least two large craters, one of which is mostly in shadow. The upper portion looks darker than the rest of Hydra, suggesting a possible difference in surface composition. From this image, mission scientists have estimated that Hydra is 34 miles (55 kilometers) long and 25 miles (40 kilometers) wide. "Before last week, Hydra was just a faint point of light, so it's a surreal experience to see it become an actual place, as we see its shape and spot recognizable features on its surface for the first time," said mission science collaborator Ted Stryk, of Roane State Community College in Tennessee. Images of Pluto's most recently discovered moons, Styx and Kerberos, are expected to be transmitted to Earth no later than mid-October. Okay: Everyone say it with me! Joking aside, this is awesome. I had no idea pluto had three satelites. That's because it has five? Nyx, Styx, Kerberos, Hydra and Charon. 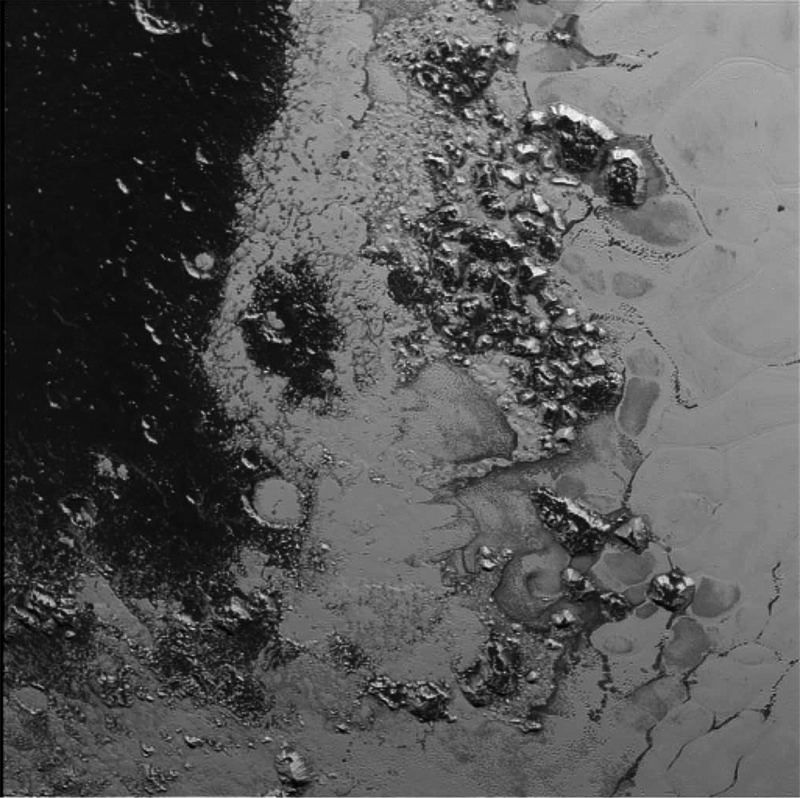 So yeah, not only is Pluto geologically active, it's got a more substantial layer of atmospheric haze than initially though, and bloody great glaciers sliding about. I love the nerds at NASA, truly. 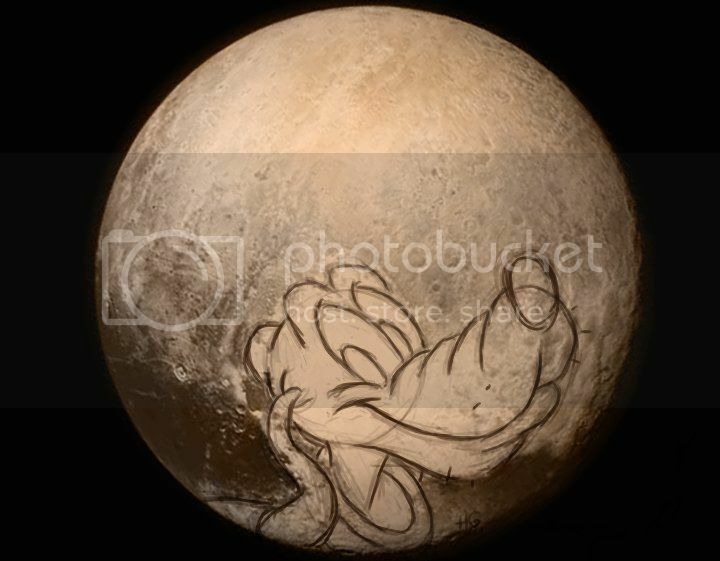 It kinda makes sense since Pluto was the origin of some Lovecraftian nasties. 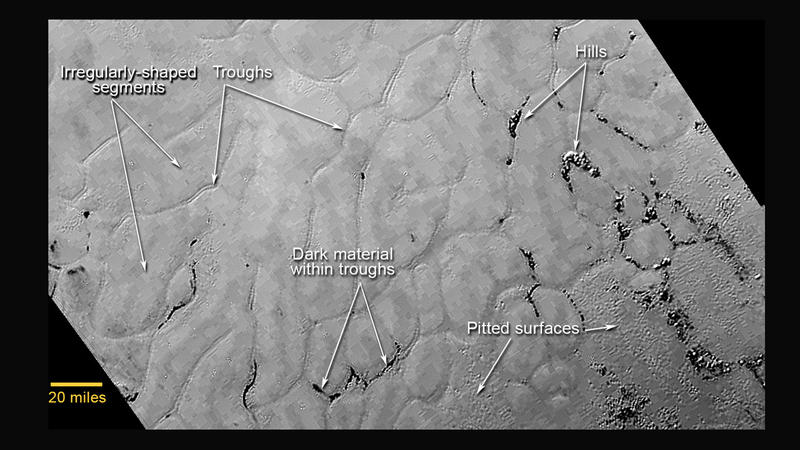 Though if they wanted to be more accurate they could call it Yuggoth Regio. I wonder how fast we can get a satellite and rover to Pluto? That puppy needs intense study! Too bad we never got that movie adaptation of At The Mountains Of Madness. The sequel could've been set on Pluto at this rate.